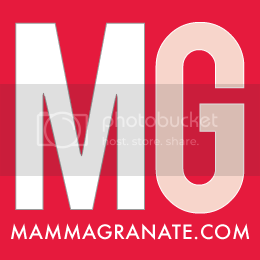 mammagranate: I'm half my Mom, half my Dad and on a mission to organize! I'm half my Mom, half my Dad and on a mission to organize! I love both of my parents and they have both passed down some wonderful traits. One big thing my parents differ on (and have both passed onto me) is their views on organizing. My mom is EXTREMELY neat and organized and my dad is EXTREMELY not. 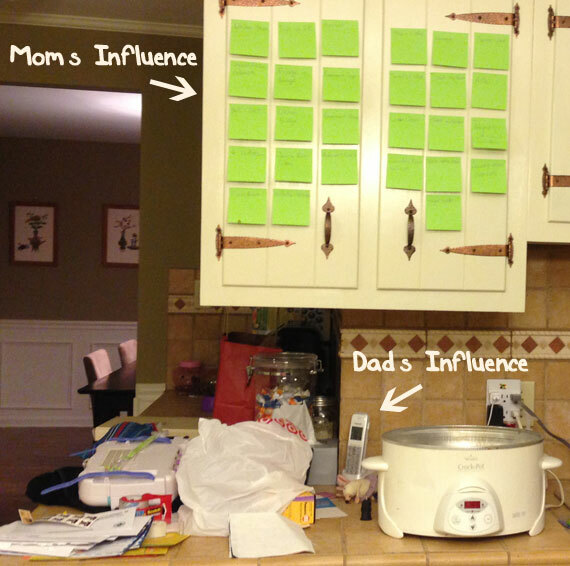 It works well for both of them; my parents' house is extremely neat and organized thanks to my mom. My dad doesn't care either way, messy or clean, he just does what my mom tells him to do. I have a little of both. I have the ability to organize when I want to but have no problem leaving dishes until the morning. Recently my house has gotten out of hand. Clutter is everywhere and I just need to make it disappear. I decided to come up with a game plan. 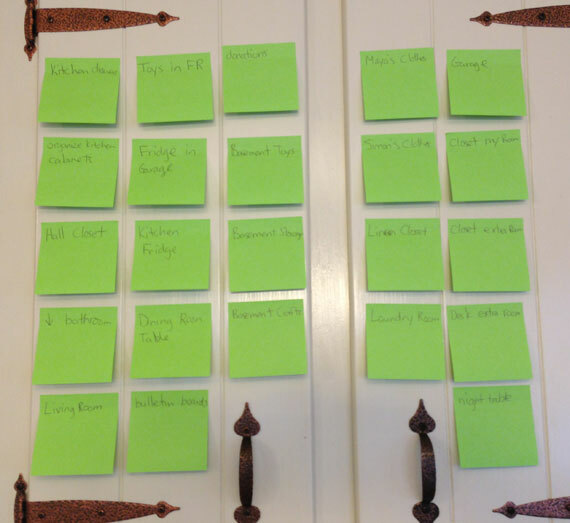 I got out some lime green post-it notes and began writing all the projects I need to complete. Reorganize the kitchen drawers, box up outgrown kids clothes and so on. I hung them up on my kitchen cabinets and I'm only allowed to take them down once the project is completed. Some are small projects like refolding the towels in the linen closet; some are big like organizing the toys in the basement. I'm going to try to tackle at least three per week, more if possible! 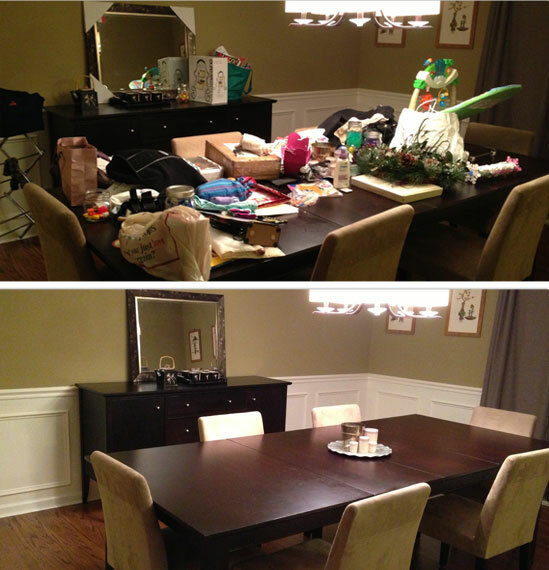 My first project was the dining room; it became the catch-all for everything. Holiday decorations that we took down, things people left at our house, mail that needed to be gone through. Tonight I did it. I found things I was missing and I feel like I accomplished something! 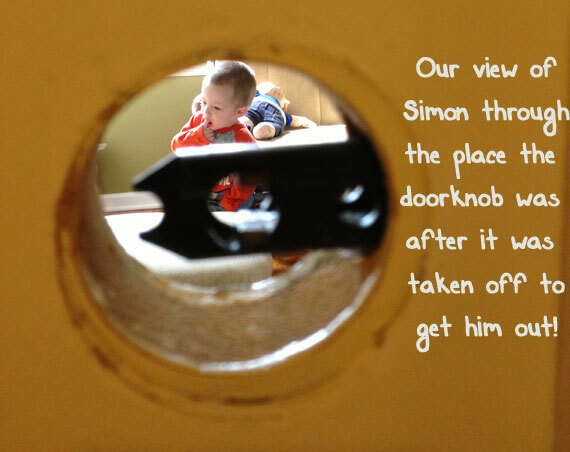 On another note, Simon locked himself in his room. I couldn't find the correct tool to unlock it and I couldn't remember how we got Addie out of my downstairs bathroom when she locked herself in there. Thankfully Mandi remembered and came over to save the day! Thanks Mandi!! Now I need to add "change doorknobs to ones that are easy to unlock" to my to do list!